Water, either escaping from pipes or entering through roof leaks, can cause devastation to a buildings fabric and its contents. The priority is to stop the flow of water and to make safe the electrical installation. Only once this has been done drying out and restoration work can begin. 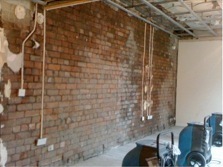 Our aim is to return your property back to its pre-incident condition as soon as possible. 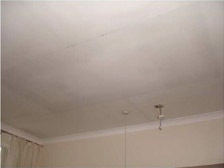 We remove damaged plasterboard, usually bowed due to weight of water, or having already partially collapsed. Laminate flooring, where fitted, needs to be removed as the underlay and sound insulation will be wet, as will the sub-floor below. We can often dry carpets in situ using a blower. Next we install dehumidifiers and circulation fans to rapidly draw out moisture from the building fabric and pump it away to drain. Our dryers can remove up to 55 litres of water per day. These are left running day and night and need no interaction as they automatically pump the drawn out water up to 12 metres away to drain. 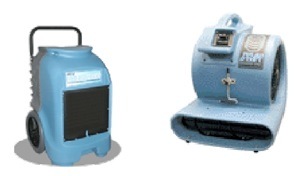 Depending upon the extent of water damage due to both the volume of water and how long this was run- ning for will largely determine the number of dryers and how long these are needed for. The room shown required 3 dryers for over a week to fully draw out all moisture from the building fabric before we could commence installation of new surfaces. We use professional Dri-eaz equipment, recognised as one of the most effective solutions for restoration, commercial and industrial use. 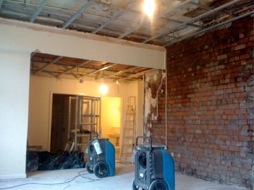 We undertake reinstatement of surfaces such as plasterboard walls and ceilings, plastering as required, and undertaking joinery works such as kitchens, doors, skirting boards etc. Finally we can undertake all painting and decorating work. We can undertake all of the above services for you. You can appoint us directly or arrange for your insurance company to manage this on your behalf. Remember, the quicker you act, the quicker we can respond and limit the damage saving you disruption and expense.